The Queensland Police Museum is situated on the ground floor of Police Headquarters at 200 Roma Street, Brisbane. The museum is open 9am to 4pm Monday to Thursday (closed on Friday). Between February and November, the museum is open 10am to 3pm on the LAST Sunday of the month. The museum is closed on all public holidays and usually for two weeks between Christmas and New Year. It all began the same way that most Police Museums do… by an act of bureaucracy. On 27 November 1893, Mr Finucane, Chief Clerk of the Queensland Police signed a memorandum on behalf of Commissioner David Seymour, which instructed all police officers to send in items of interest concerning crimes and suicides, that they might come across during their duties. And so, the Queensland Police “Museum” was born. While not really a proper museum to begin with, it constituted as much as we can discover, a glass cupboard and then a small room. The collection was by nature eclectic and included some very gruesome things. You only have to read the story from the Brisbane Courier of 1895 to appreciate the ambience that would have surrounded the collection. The objects were initially housed at the Petrie Terrace Depot and police officers were required to see the display as part of their training. There are only a few objects from the original collection left as some were transferred to the Queensland Museum in the 1930s and the rest seem to have either dried up or disappeared over the years. The fake gold nugget (1894), currently on display, is the oldest original museum object still existing in the collection. By 1930, the Museum was still located at Petrie Terrace Barracks. In 1934, a new appeal for objects was made by then Police Commissioner, Mr Carroll, but by 1940 the collection had been packed up in boxes due to lack of space. Then on 13 July 1949, the collection was officially handed into the care of Detective Constable Les Bardwell, head of the Technical Section, Criminal Investigation Branch, at the old church building in George Street, Brisbane. Bardwell was keen to study, classify and set them up as museum pieces to join his already extensive firearm reference collection. He also wanted to show off the collection and in September of 1949 requested the purchase of display cases to be used at the annual Royal National Exhibition (RNA). Displays were organised for this show every year and people still remember the Police Display as a room “stuffed with unusual objects”. Sometimes displays were loaned out to other shows but due to security and other concerns this did not happen often. A display of objects was also set up by Bardwell and his team for the centenary of the Queensland Police Service in 1964 which took up space in the window of Allan and Stark (a retail store at 110 Queen Street, Brisbane). 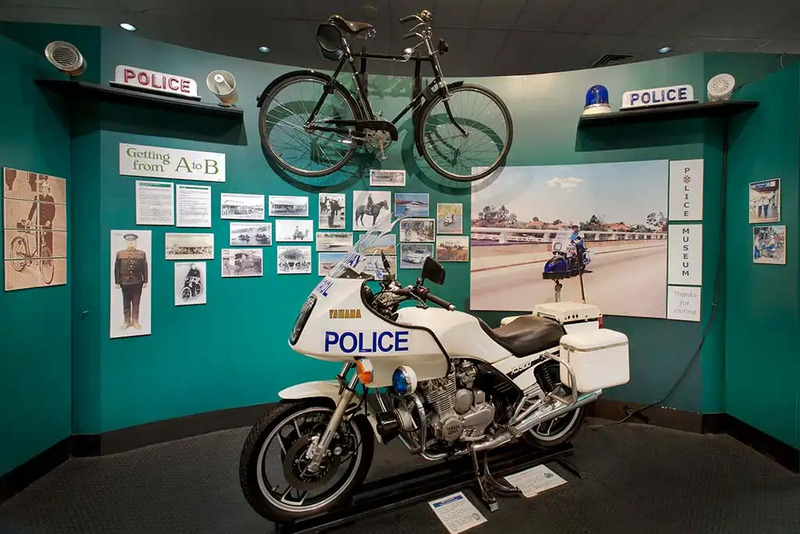 An exhibit from the Police Museum still appears at the EKKA (RNA) police display every year. In February 1978, Commissioner Terry Lewis approved the formation of a Museum Committee which included members of the Public Relations Branch, CIB, Photographic Section and the Commissioner’s Office. It was their job to sort through the collection and decide what was to be kept and displayed. On 20 May 1979, the “new” Police Museum opened. It was located on the 7th floor of Forbes House in Makerston Street, Brisbane and was not initially open to the public, but group bookings were taken. In 1980, the Museum was opened to the public on Wednesday afternoons and in 1981 Ross Chippindall, an assistant in the Media Liaison office was appointed as part-time Curator. Although Chippindall had no museum qualifications, he was an avid scrounger of collection material and a firearm enthusiast. By the end of 1982, four thousand people had passed through the doors and displays were being mounted at school fetes and country shows. After Ross Chippindall was killed in a traffic incident in 1985, Sergeant 2/c Bob Good temporarily took over the running of the museum and over a year or so, managed to have the museum displays refurbished and a system in place for evaluating the collection material. In 1986, Gabrielle Flynn with skills in historical research and education, was appointed as fulltime Curator and the Museum began opening for five and a half hours per week. By the late 1980s, plans were in place to build a new Police Headquarters in Roma Street which was to include a purpose-built home for the Police Museum. The building, along with the new museum, opened in August 1990. The display area was divided into six colour-themed areas – Heritage; Crime; Technology; Developments; Murder and Crisis (The colour scheme even won two Dulux Colour Awards). The Curator, Gabrielle Flynn was kept busy with visiting school groups, designing photographic displays and answering historical enquiries. The Museum could now open every weekday. Ms Flynn resigned as Curator in 1996 after ten years of productive and vital work. In 1997, the current Curator, Lisa Jones, commenced work and later that same year the positions of Assistant Curator and Museum Assistant were created and filled. So, for the first time since 1893, the Museum had three full time staff. The Museum’s aim is to continue to raise the profile of the Queensland Police Service amongst the Queensland community, by showcasing its fascinating history through our displays and education program. There have been a lot of changes in the Museum’s history. The collection has seen many homes, the displays have been refurbished more than once and objects have been both lost and found, but the Queensland Police Museum has not only survived these years, it is one of the best of its kind in the world. We hope that it will continue to uphold this standard!